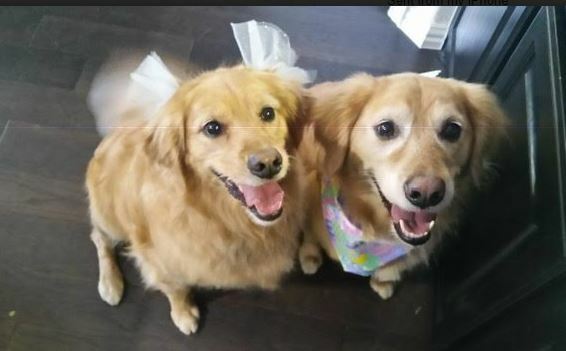 Name: GOLDEN RETRIEVER RESCUE ALLIANCE, INC.
Zeus (m) and Zoey (f) – Bonded 6.5 year old littermates - GRRALL #0739/0740 Welcome Zeus and Zoey! Our newest GRRALL pups are bonded 6.5 year-old littermates, best buddies and must be adopted together. Zeus and Zoey’s humans are moving to a retirement community that does not allow dogs. They have been well cared for and are friendly pups. They are good with children but haven’t been exposed to cats. Zeus and Zoey are in their GRRALL foster home now and doing great. If you are interested in adopting Zeus and Zoey or any GRRALL dog, please read our FAQs (https://grralliance.org/faq/) and then submit an application at https://grralliance.org/applications/adoption-application/ GRRALL serves the Dallas-Fort Worth/North Texas area. We do not have the resources to adopt outside this region and do not ship dogs. If you are outside our adoption area please contact your local Golden Retriever Rescue, local independent adoption groups, shelters, humane society, or other group to find your perfect forever friend.